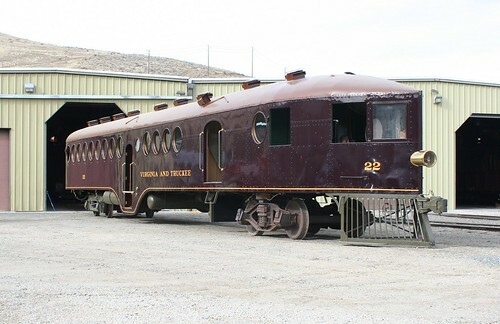 The McKeen Motor Car (#22) is a historic motor car that ran on the Virginia and Truckee Railroad. It is now contained in the collection of the Nevada State Railroad Museum. 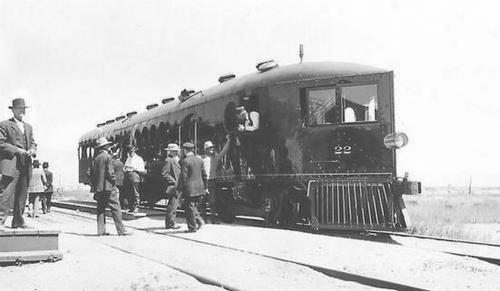 The car was bought from the McKeen company in 1910 when the railroad needed some less expensive equipment that it could use to make daily runs from Reno to Carson to Minden. These motor cars ran on gasoline instead of steam and made for good "commuter" vehicles to carry passengers and mail. The railroad, over its lifetime, gathered a motley fleet of these cars, in a wide variety of body styles and from a wide variety of manufacturers. But this particular car, #22, was the only McKeen in the roster. In fact, only 150 of these cars, with their round portholes and distinctive "wind-splitter" design, were ever even built. They ended up scattered all around the country, and most of them were scrapped after they had outlived their usefulness. But not V&T #22. It is one of only three or four that have survived to the present day. The lucky thing that saved #22 is that a use was found for it after the railroad didn't need it anymore. 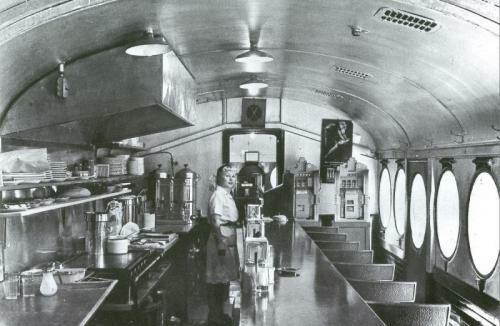 In 1945 the V&T put #22 out of service, but instead of scrapping it, the car was sold and converted into a diner. 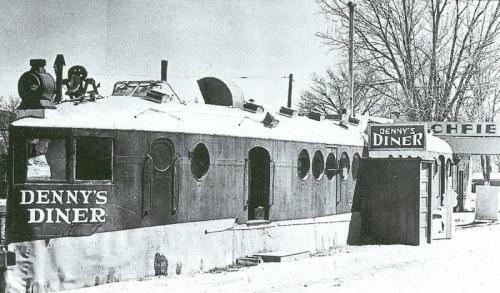 The wheels were removed, it was mounted on a foundation near the corner of Carson and William Streets, and it opened as Denny's Diner. Denny's Diner at William Street, with the Richfield gas station in the background. Denny's Diner didn't last more than a few years, but again #22 got a repreive. 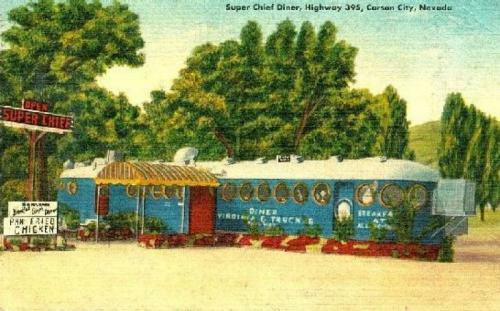 It was moved a few blocks away, to Long Street, and reopened as the Super Chief Diner. But again #22 couldn't find rest. In 1955 it was moved again, this time ending up along Carson Street at the south end of town. This was at 1400 S Carson St, right where Batteries Plus is today. And at last the McKeen car found a little bit of peace; it was modified and attached to a wooden building on the site, and it ended up staying there for over 40 years. Joining it was another motor car that had operated in Yerington, a Hall-Scott vehicle that was also, coincidentally, numbered #22. By the 1960s both motor cars, and the building connecting them, were owned by Al Bernhard, and for decades they operated as part of "Al's Plumbing and Heating". If you've lived in Carson long enough you can probably remember seeing them there. In the early 1980s the Nevada State Railroad Museum opened up in Carson City, and started rounding up all the old V&T equipment they could get their hands on. #22 was one of the pieces they were interested in, and it took over a decade of negotiation before Al agreed to donate the car to the museum. On April 22, 1996, #22 was torn off its foundations once again and made the move a few blocks south to the railroad museum. Restoration work started almost right away, but a lack of funding made sure that it would be slow-going. Restoration was finished in 2010. The car was unveiled at a ceremony on May 9th, 2010, which was the 100th anniversary of the day the McKeen Car first arrived in Carson City. This page was last modified on 20 June 2012, at 14:15. This page has been accessed 11,260 times.